Well... I *was* really excited that I finished the Lotus Blossom tank. The fabric is beautiful. The little alien heads/lotus blossoms are pretty. But it's just too darn short. I'm just thinking not-so-much my style. It takes away from the cute shaping of the neckline and in my opinion looks a little dumb. Nother problem was where the lace began. I'm not exactly well endowed, but my little tykes could peek out at the bottom of the stockinette. If you've got a little more upstairs than I do (I think most women out there do) you may want to consider adding a bit more stockinette just for the sake of decency. I don't think I knit it wrong. In fact, as I took a look again at the magazine I think it's a fairly short top on the models as well. I just don't own pants that come up to my belly button so I end up with the need for even longer shirts. So... last night while watching Jimmy Neutron I frogged the top part back to the armpits and picked up the stockinette banner once more. I figure I'll add another 4 inches of stockinette to the top. The lace should start somewhere near my belly button and it'll give me the length I want. Oh, and it's so beautiful in that purple plum too! Good luck on lengthening your tank! Have you tried blocking yet? Blocking can drastically change the size and appearance of the lace, which might just solve your problem. Good luck! It's very pretty. . . sorry it doesn't fit quite right. I think the designer is probably of the short-torso persuasion (like me). gosh, it's really cute! But I can see your concerns about wearing it to work. It would be cute as a bathing suit cover up with a sarong! But thanks for the heads up. I'd been thinking the stockinette portion didn't seem quite long enough, and your post confirms that. I'm definately going to have to lengthen too. Thanks for sharing that info. 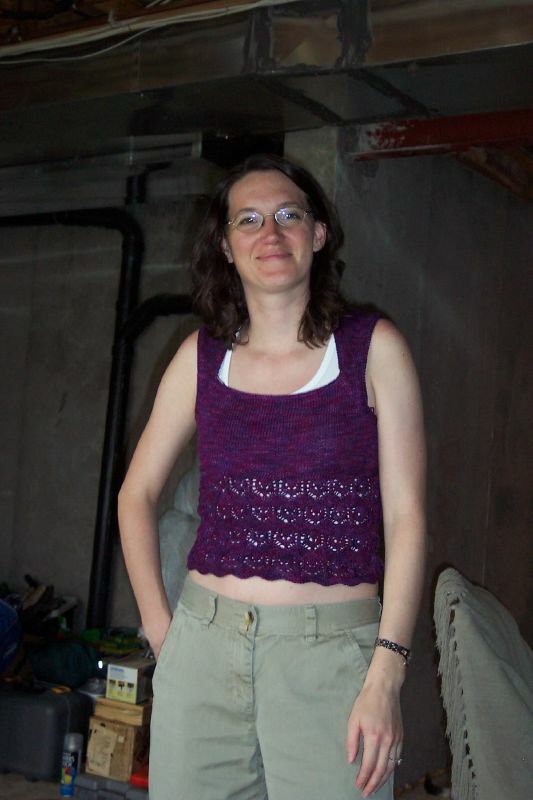 I bought yarn for this top this week, and was thinking that I would need to lengthen it - you've just confirmed that. I was totally baffled by the schematic given in the directions - where do all those measurements come from? Obviously if you added up all they put there, the top would be 35+/- inches long, which clearly it is not. Too bad about the length, but your layered look gave me an idea. It may not look too good with a white wifebeater, but layered over a close-fitting long-sleeved black top, it could make a cute vest thingy. 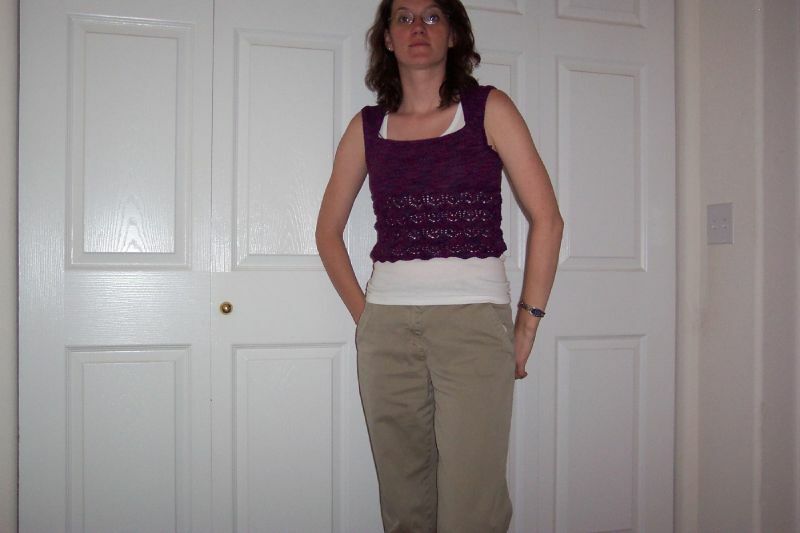 If mine works out, I may make another one in purple or burgundy to wear over something black during the fall and winter. It looks really cute on you anyway!